Digestive Health|About Us|Blog|Colon Cancer Screenings: What Test is Best? While US guidelines still recommend a first-time screening at age 50 for those not at high risk, research shows that colon cancer is no longer an “old person’s disease”. Someone born in 1990 now has double the colon cancer risk of someone born around 1950. If you’re at risk or notice symptoms, what is the best colon cancer screening method? Your options are an at-home colon cancer screening kit or a colonoscopy, and when you choose between them, you will want to consider three factors: accuracy, cost, and convenience. An accurate, thorough screening is essential because results you don’t trust are pointless – and potentially fatal. At-home colon cancer screening kits claim to be highly accurate, but both the small print and research tell a different story. There’s a high risk of self-contamination and results are not reliable.Eight percent of known colon cancers go undetected. Fifty-eight percent of precancerous adenomas are missed, and 13 percent of users get a false positive. A colonoscopy can identify colon cancer at all stages, precancerous growths, and other digestive diseases. By choosing a fellowship-trained gastroenterologist with an above-average adenoma detection rate (ADR), and a surgery center with industry-leading AAAHC and CMS safety and quality certifications, you can be confident your colonoscopy will be safe, accurate, and thorough. At-home colon cancer screening kits may seem less expensive and may be covered by health insurance, but if you’re not confident in the result or you get a positive result, the next step will be a diagnostic colonoscopy. As a second screening, a colonoscopy may not qualify as a preventive health benefit – meaning you will be responsible for the cost. Procedures at independent ambulatory surgery centers, like Digestive Health Center in Reno, cost a fraction of what you might pay at a hospital or hospital-affiliated center. An at-home colon cancer screening kit seems more convenient. There is no appointment to attend, and the test can be done in the privacy of your own bathroom. However, the administration of the test is up to you, and there is a high risk of contamination. While a colonoscopy may not take place at your house and is not as simple as a bathroom break, it’s still pretty easy. And, once it’s done, you can rest assured you have an accurate picture of your colon health. In most cases, procedures take only 2 to 3 hours from the time you check-in until the time you leave the center. The expert medical staff is there to support you and ensure you get a thorough screening and accurate results—no DIY diagnostics required. As you’ve seen, ultimately, a colonoscopy costs less than an at-home colon cancer screening kit – and is certainly more reliable. However, a colonoscopy has another huge benefit an at-home colon cancer screening kit could never offer: preventive measures and early treatment. During your colonoscopy, your gastroenterologist will remove any cancerous or precancerous growths, stopping colon cancer in its tracks. 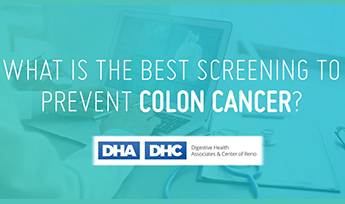 To ensure you get a thorough, accurate screening and early preventive measures, choose a colonoscopy for your colon cancer screening. Choose Digestive Health Center in Reno to ensure you get top-quality care from expert gastroenterologists and a medical team that is experienced in endoscopic care. The facility is certified and accredited by the leading organizations in ASC quality and safety. A choice for a colonoscopy is one that could save your life. Call Digestive Health Reno at 775-600-4717 to learn more or schedule an appointment.